Happy Friday everyone. Today I am joined in studio by Rusty. We had a very spirited chat about being a mechanic vs being a technician. We come at it from 2 very different angles, and that makes the conversation fun. There is a little weirdness in the first part of the show. I had a camera issue that day and it impacted the video quality. The second part of the show’s video is back to normal. The psychology behind the words. QOTD ~ Do you consider yourself a Mechanic or a Technician? Trouble viewing? Watch “Being a Technician vs Being a Mechanic ~ Podcast Episode 70” on YouTube. As always your questions and comments are very much appreciated. 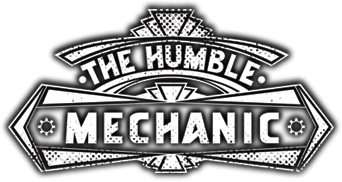 If you have a suggestion for a show topic, use the contact me form, or email me Charles(at)humblemechanic(dot)com. I would also like to thank Rusty for joining me in studio today. It is always a fun time chatting with him, even more so when we don’t 100% agree. Hey I have been following you page for a few months and I always see your toolbox full of stickers I was wondering if you have or ever thought about making some humble mechanic stickers I’d definitely buy one. Thanks for the great videos keep it up.